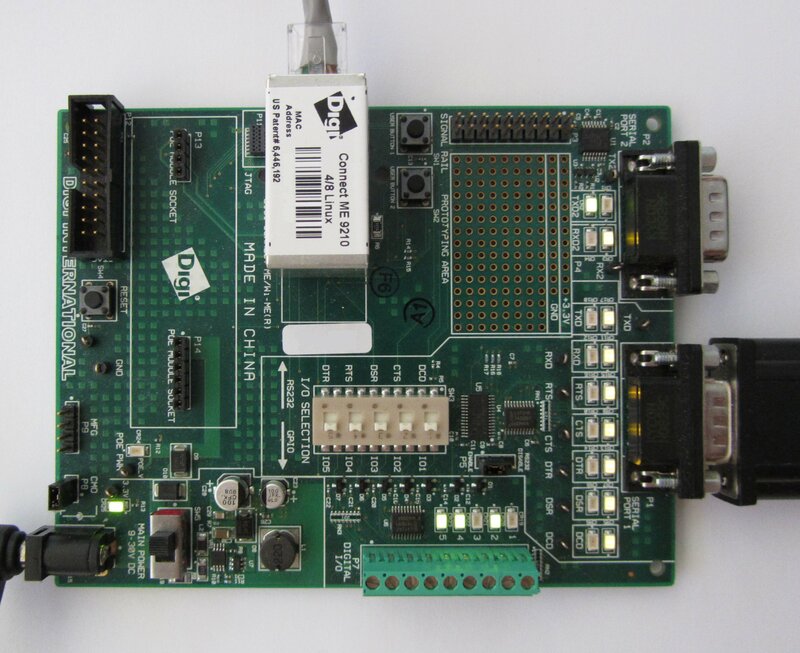 This quickstart guide shows how to build and debug a simple application on a Digi Connect module using VisualGDB. 2. 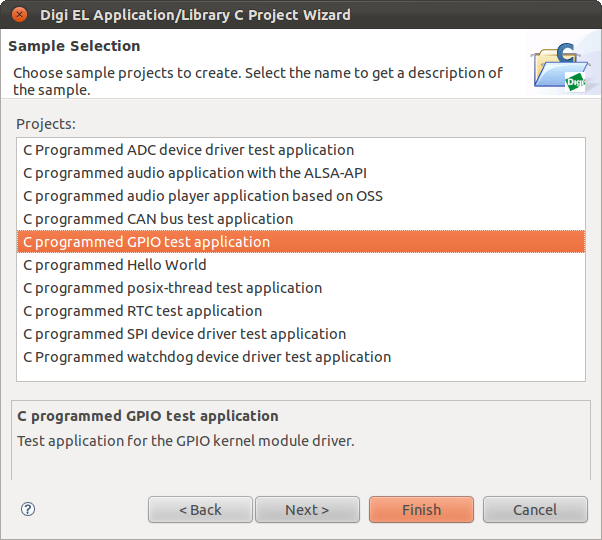 Then select the sample GPIO project and press “Finish”. 3. 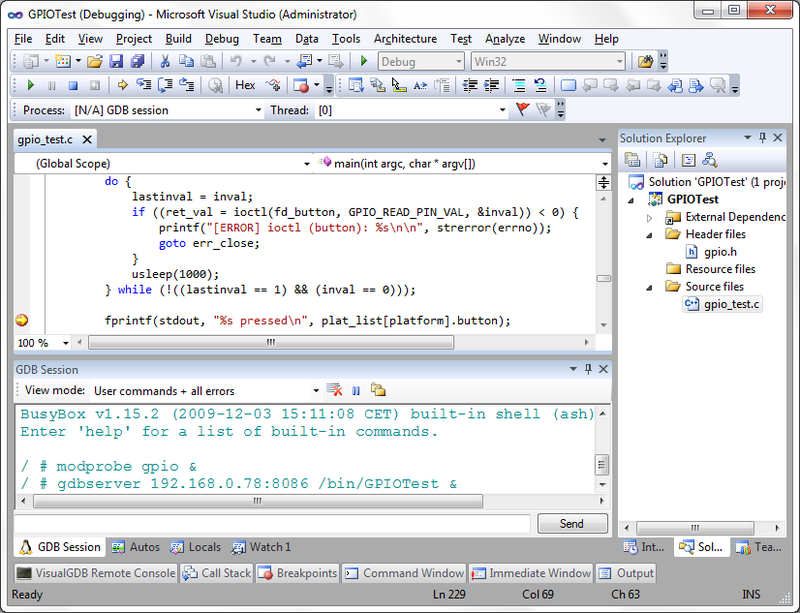 Next build the project Debug version and ensure that it runs. 4. Run the debug version. 5. 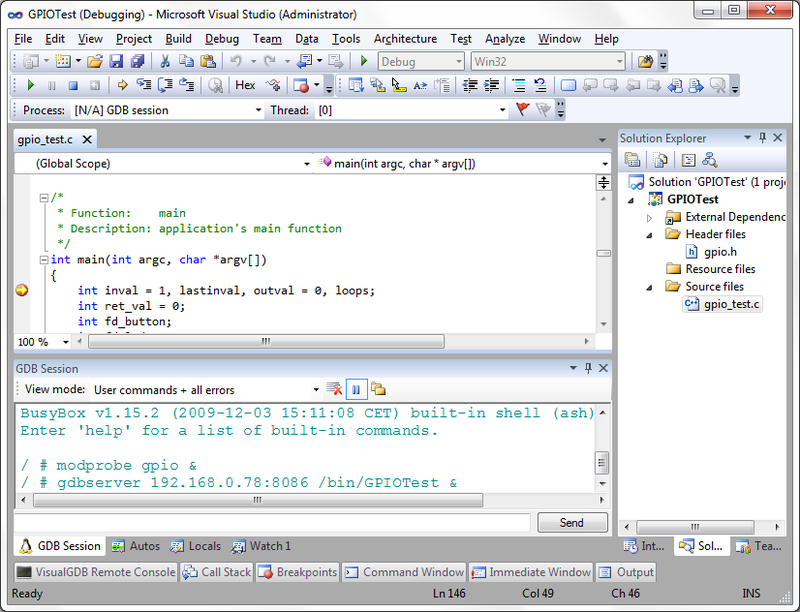 Go to Debug Configurations and make the debugger output verbose. 6. 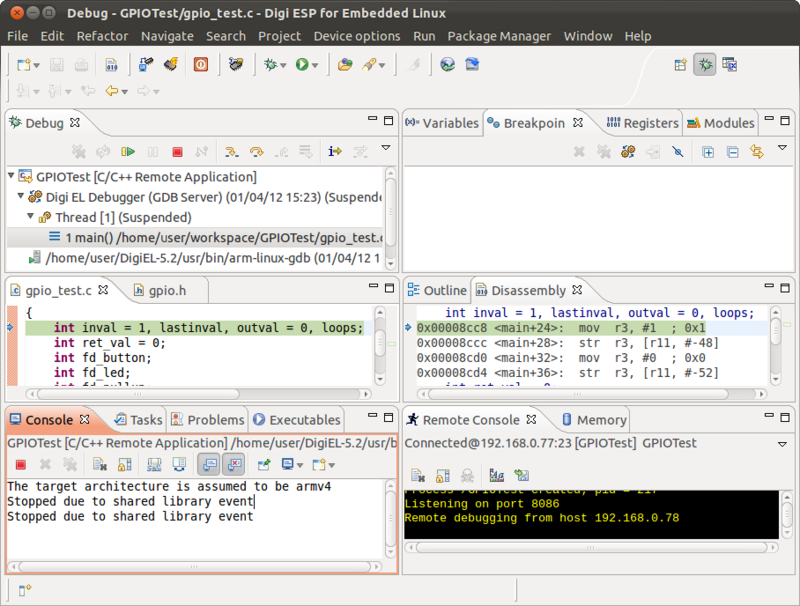 Run the debug version again and observe the flags Digi ESP uses for gdb. 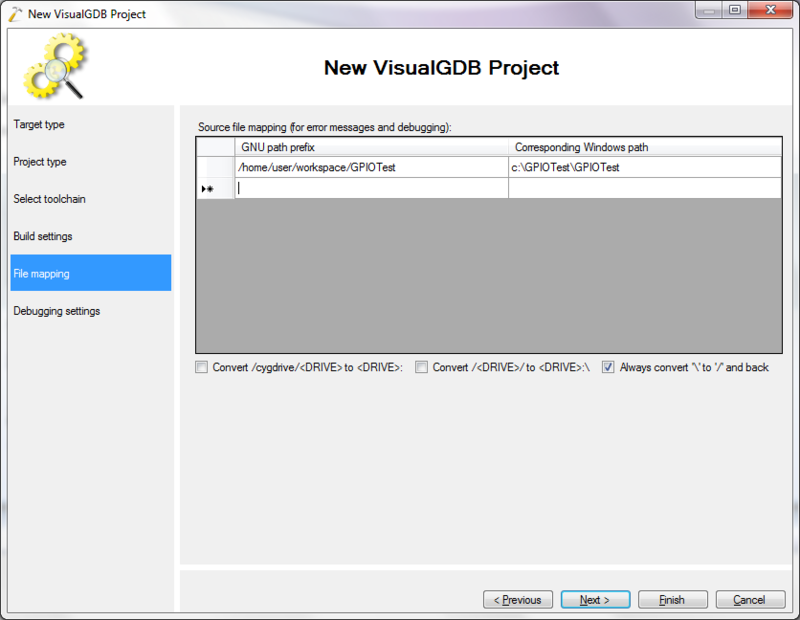 We will need these flags later to manually set up gdb. 7. 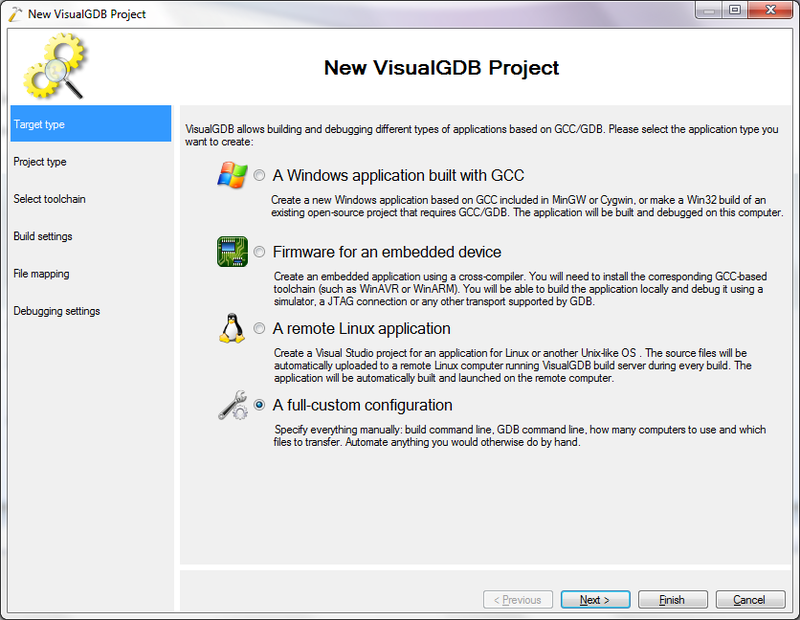 Now we are ready to make a VisualGDB project. 8. Choose a full custom project. 9. 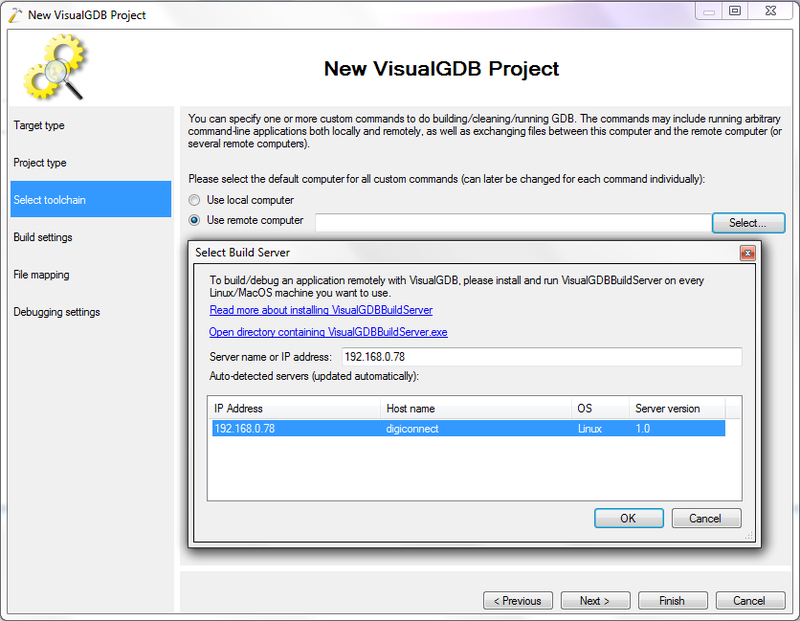 Choose the vm as the build server. 10. 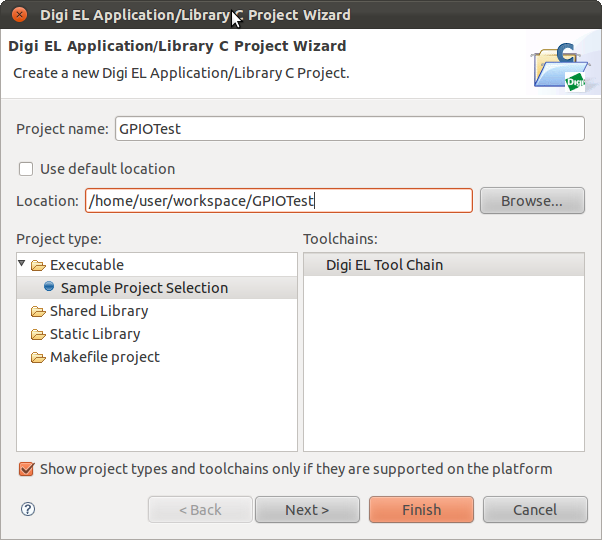 Add copying the files as a build command. 11. Add a make all build command. 12. Add a make all build command. 13. Add a make clean command. 14. The build and clean commands look now like this. 15. Now we set up path mapping. 16. 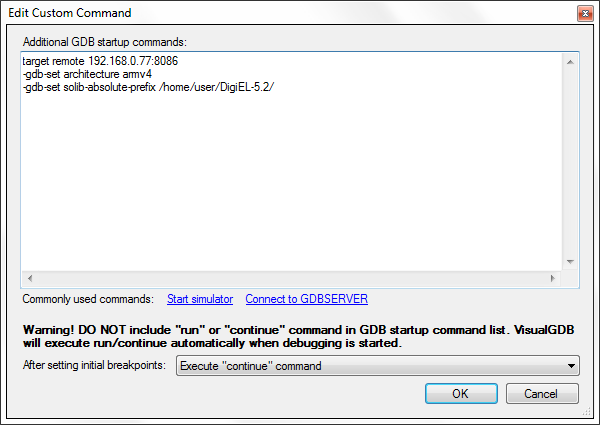 We use a script to start the gdbserver on the device and load the gpio kernel module before starting GDB. send "gdbserver 192.168.0.78:8086 /bin/GPIOTest &\r"
17. 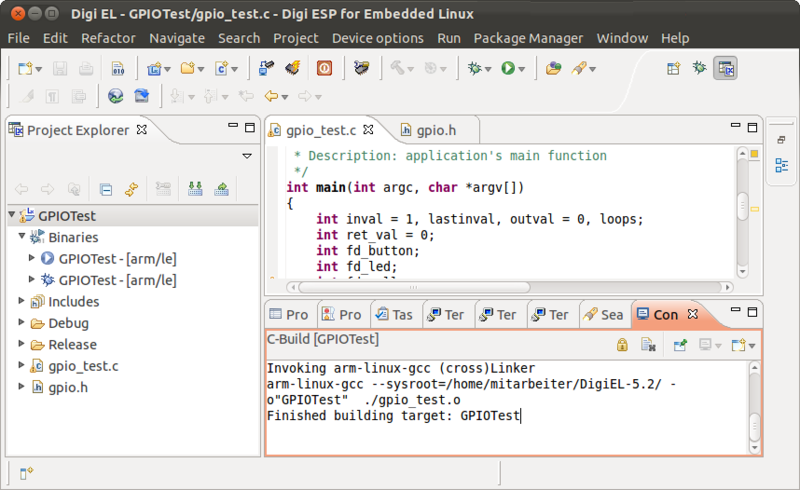 We use the arm-linux-gdb provided by Digi. 18. 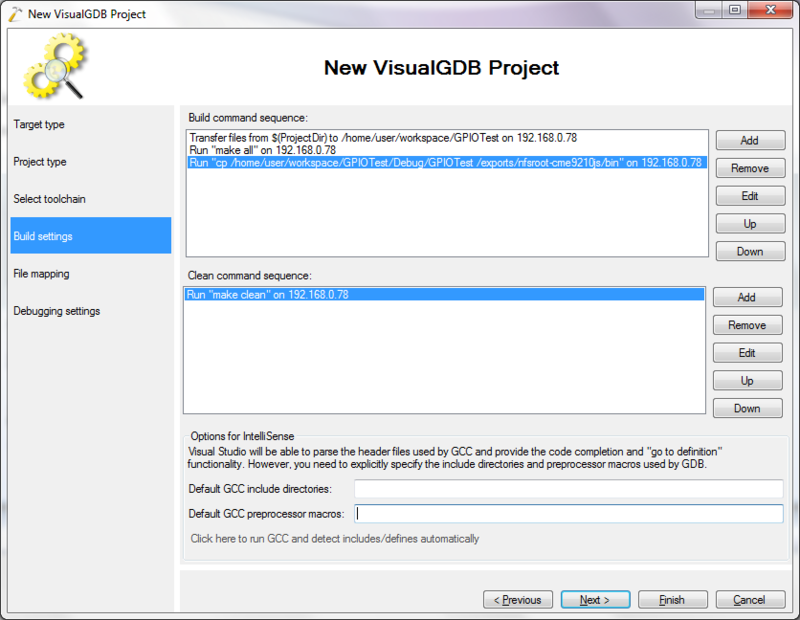 We use another script to kill the gdbserver after debugging. 19. 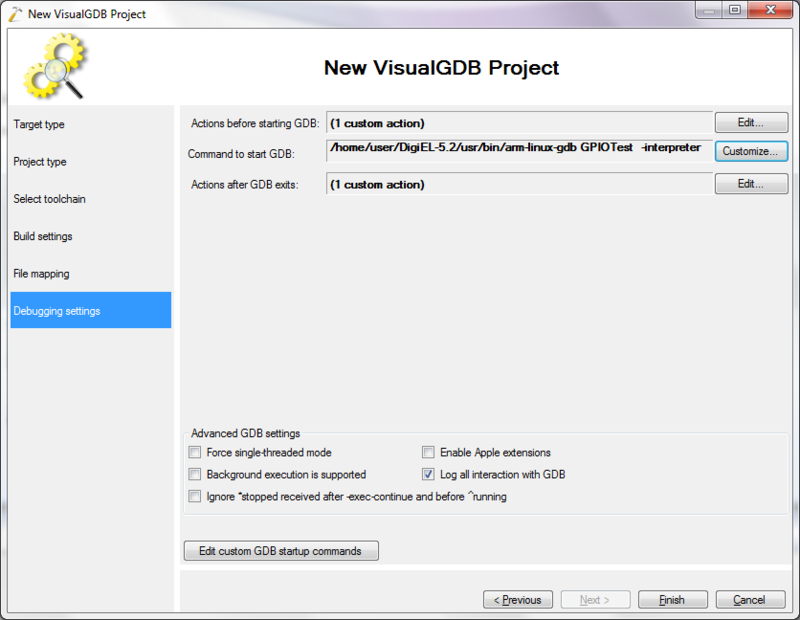 We need to specify the flags for gdb. 20. 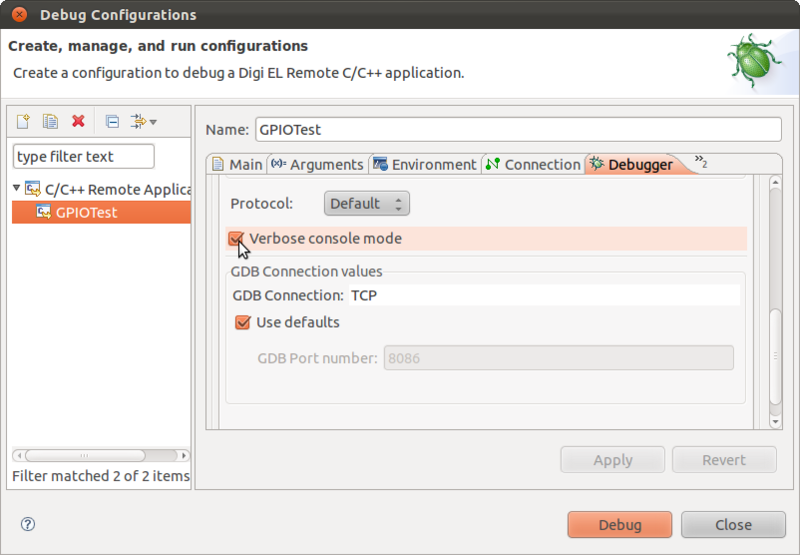 Now our debugging settings look as follows. Press “Finish”. 21. 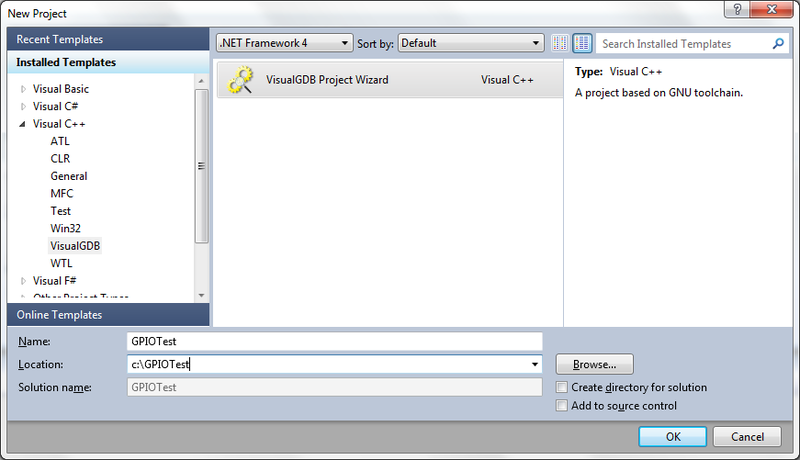 Let’s go to Project->VisualGDB Project Properties and then method of breaking. send "killall -s INT GPIOTest\r"
23. 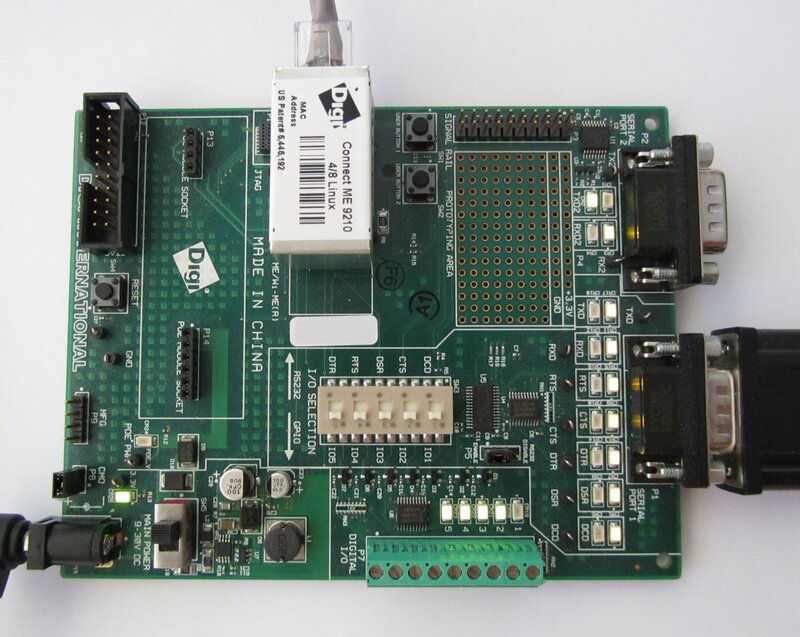 Set a breakpoint as shown, then press the user button 2 on the development board. Observer how the breakpoint is reached. 24. Press the button more times, observe how the Led 3 turns on and off.